Infinite Art Tournament: Celebrating 520 Years of the Treaty of Tordesillas! Celebrating 520 Years of the Treaty of Tordesillas! Tomorrow marks 520 years that the famous treaty dividing the Americas between Spain and Portugal along a north-south meridian has failed to do any such thing! 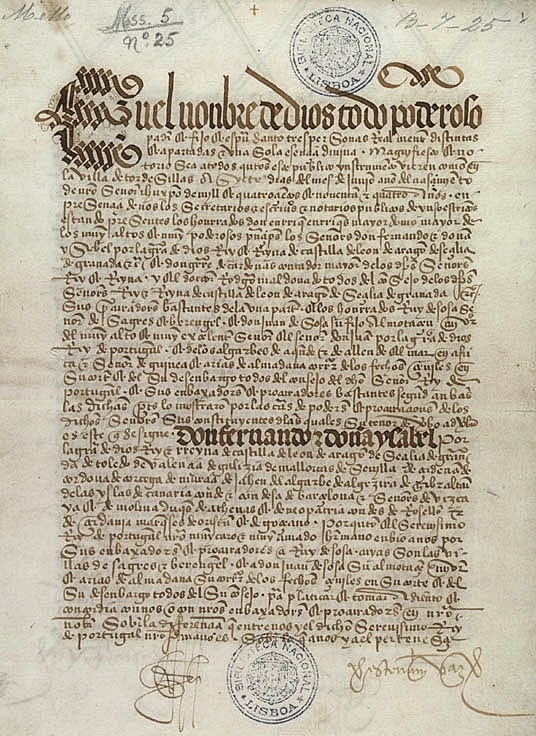 The 520th anniversary of the Treaty of Tordesillas is, of course, also the 6th anniversary of the 514th anniversary of the Treaty of Tordesillas. That means the landmark decision of Griswold vs. Connecticut will be 49 years old tomorrow! And thus it is also the Nitrogen Anniversary of the Infinite Art Tournament!!! We'll celebrate with a FOURTH-ROUND Tournament pairing! That will be great fun. Meanwhile, thanks again for indulging my little online magazine. How this blog is made. Oh! Congratulations! I'll have to go out and buy you some nitrogen-rich fertilizer to celebrate. You'll be happy to know the dracunculus vulgaris is really stinking up my office today. The stench of the dracunculus vulgaris!!! Another wonderful 7-year Castle5000 tradition!